Mechanical music combines art, music, mechanism, and design into a very entertaining antique. Not only are you intellectually entertained, you are also having fun. Each roll or cylinder is a time capsule of history, no other antique can give you the same concert that was given to generations years ago. The locally produced crank organs, which are called Steinkjer Positives, are fantastic time capsules of local traditional music. The Steinkjerpositive is a mechanical organ which was produced in my town. 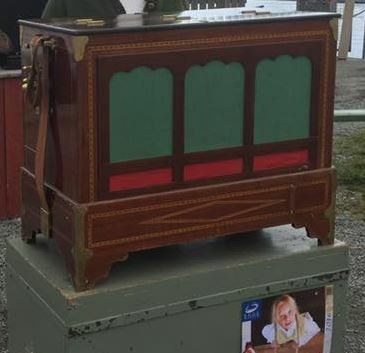 The Steinkjerpositive is a standard in Norwegian barrel organ traditions. Approximately 600 instruments was built in the from 1850 to 1910 in Steinkjer. The instrument makers were Thomas Fosnæs (1813-1870), and his students, Christian Tharaldsen(1829-1923) and Jakob Skjefte(1841-1910). The last of the four instrument builders was Theodor Bentsen who also contributed with many instruments. It have been quite interesting to learn the instrumentsmakers in my own region and their production of instruments. It have fueled the wish to have one of these myself. The sound example available here is from the Positive marked no. 15, built by Thomas Fosnæs in the early 1850's, it is a 22 pipe instrument. The music played is a "røros-pols" composed in the area of Steinkjer played by musicians at the time. The other sound example same Positive marked no. 15, built by Thomas Fosnæs The music played is a "Reinlender". The music in these barrel organs differs quite a bit from the similar German or English organs of the same time period, since the music is traditional Norwegian folk music from the area around Steinkjer. The town where I grew up, Steinkjer just north of Trondheim there was several instruments makers. It was built around 600 instruments during a period of 60 years. 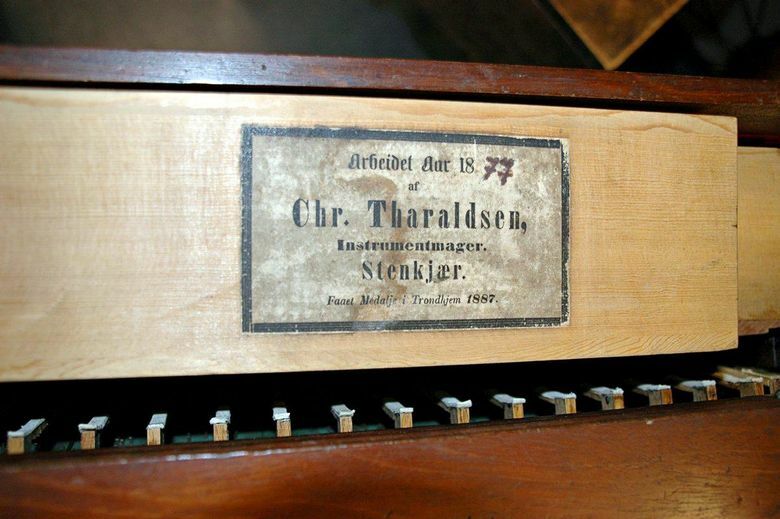 The oldest known Steinkjer Positiv organ is made by instrument builder Fosnæs in 1856. Tharaldsen was however the most productive builder, he have made around 400 of the 600 known instruments. So what is a Steinkjer Positive? The Steinkjerpositive was a well known local brand in the mid 1800s, the production were at such a scale, that it got known as the positive from Steinkjer. Hence the instruments got their name. The time was an era where mechanical music was very popular in Europe. And when the instruments did find their way up to Norway, local instrument makers were needed to repair and fix them. This founded the idea, for our instrument builders to build our own version of the instrument, programmed with the music played locally at the time. The around 600 instruments found their way from Steinkjer and northwards all the way up to Lofoten. Thomas Fosnæs was in his time, one of the best known and a highly esteemed musician, did start a school for instrument makers. He was a leader in this work, and did help others to become skilled instrument builders. He is also known for composing a lot of music. Fosnæs number 15. is a very early instrument, and in some ways the root of all building of Steinkjer Positives. It was first when Tharaldsen, who was a carpenter came into the picture, the positives did end up as design piece or furniture. Ever since musical instruments were invented, people have attempted to turn them into self-playing instruments. It was not so much a delight in technical gadgetry, but rather people's desire for music which was the motivating force behind this development. The oldest surviving mechanical musical instruments are the glockenspiels in the monumental clocks of the late Middle Ages. During the Renaissance Augsburg craftsmen created valuable music machines and self-playing spinets which were driven by means of pinned barrels. In the 18th century the flute clock was invented, for which Haydn, Mozart and Beethoven wrote original compositions. The demands made on the technical and musical capabilities of self-playing instruments increased steadily, and at the beginning of the 19th century "mechanical musicians" such as Johann Nepomuk Malzel created whole self-playing orchestras, the "orchestrions". At about the same time in Switzerland the musical-box was invented, consisting of a rotating brass barrel with pins which plucked the teeth of a sound-comb to make them sound. In the course of the Industrial Revolution it later became possible to manufacture devices more cheaply, thus making them accessible to everyone: the sales of the instruments called "Ariston" and "Herophon", which worked on the hurdy-gurdy principle and were controlled by perforated sheets of cardboard, ran into hundreds of thousands. 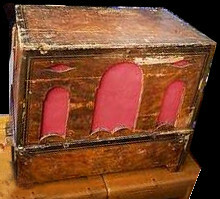 They were succeeded around 1890 by disc musical boxes, the best-known makes being Polyphon, Symphonion and Kalliope. 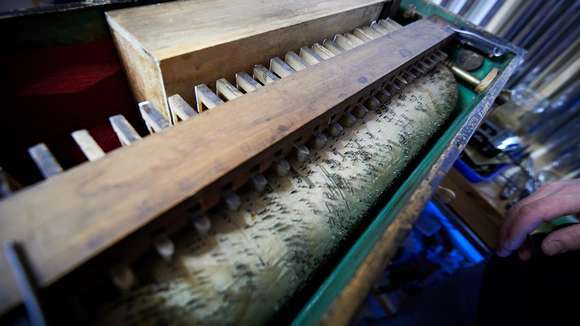 With the introduction of pneumatic techniques at the end of the 19th century it became possible for the first time to manufacture self-playing pianos which allowed a satisfactory dynamic graduation. The pedal-driven Phonolas and Pianolas found a place in every respectable middle-class household. Mechanical bands has ever since been built, this Wurlitzer CX Orchestrion from 1912 is a great example. The instrument carry many names depending on which part of the world it is described. I have heard Grinder Organ, Barrel Organ, Street Organ and Monkey Grinder just to mention a few. The local name here in Steinkjer for these music instruments is "Positive". Under you will see a photo from Trønder Avisa 9th of May 2007 where the late Charles Karlsen is playing one of these instruments. Charles did work many years to document the history and details of these instruments. 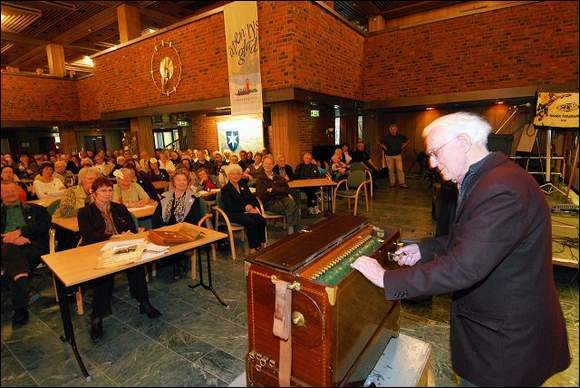 The picture is of Charles Karlsen playing a Steinkjer Positive. Charles have done a big job finding and recording most of the known Steinkjer positives. He have published a book called "28 positivslåtter" which translated means "28 positivsongs". There were 4 positive builders in Steinkjer. These craftsmen had a production of approximately. 600 instruments. The oldest instrument that is known today, is in Mo i Rana, and is built by Fosnæs. The bellows are marked with the date 24.12.1856. Egge museum owns three instruments of these, and they are occasionally for display or played at arrangements in my town. Every time they are played, I always find it worth while listening to the music, perhaps did my great great grandparents dance to the exact same performance. When a Jekt (Lokal to Norway, a small windjammer sail boat) was launched it would be absolutely necessary to play music from a Steinkjerpositive. "If not, things could go wrong at sea". The instrument was a part of creating a good atmosphere on the maiden trip, and the music would be played at the quays during loading and unloading the boats. It would also be played for dance at the quays when the boats did come home after a trip. The instruments were often played accompanied with a violin player on the side. This would then be the entertainment at weddings, public dances or other arrangements where people did gather and music was needed. This is an example of the same instrument as above, but here with a violin. These instruments have a barrel inside which lifts pushrods to open valves. The valves then let air from the airchest to up to five rows of flutes. Most Steinkjer Positives have four "choirs" of flutes. The instruments was made in three sizes. The big one (Storspælle) with 28 tones. The tones is the number of tones on the scale (or keys). The "programming" of music to the barrels inside the instruments was quite complicated and time consuming. It was important to consider the amount of air available in the bellow, since wide accords and large pipes demand more air than single notes and small pipes. It might even be necessary for the player of the instrument to play some parts of the music slower due to loss of airpressure by cranking at a slower pace. The repertoire in the instruments was popular music which were played by musicians in the area of Steinkjer. In many ways they followed the traditions of similar German or English instruments. The sound and use of the instruments was as shown in the video to the left. It was recorded in 1978, and shows dancers dancing "Stiger" or "Stegar" where the steps and dancing technique can be used both in the dances reinlender and walts. The use and build of these instruments are remarkable. Builders took traditional traditions from the continent, and adapted it to local traditions in a relative large scale. If you are wondering how the mechanical part works, look at this video where you can see the barrel holding up to 10 songs lifts the pushrods which operate the valves for the flutes. This video from The Mechanical Instruments museum in England, explains how the barrel organs work. I have been to this museum twice, and it really is worth while visiting if you are around its whereabouts. The instruments made in Steinkjer were in many aspect built like other instruments from all over Europe. The valves were actuated by pushrods lifted by pins or hoops which are nailed into wooden rolls. Short tones made by the pins, and longer notes made by the hoops. Explained rather simple the instrument works by the barrel rotating, where each brass pin lifts a pushrod, which in turn opens a valve, which let air from the airchamber to the flute. There are racks of flutes, tuned to the same tone mounted to the same valve. When you crank the instrument, the crank handle does two jobs, one is to actuate a double bellow, which compress air into a magazine bellow, and the other to rotate the barrel so the music is played. In most instruments there were three racks of pipes, which the player could choose to use by manual leavers, thus enhancing the music to be played either soft with one rack of enclosed flutes, or loud with a	rich sound using all flutes, including the open ones making more sound. Since I like techno, mechanical objects and play music, it somewhat is obvious I should have a soft spot for mechanical music instruments. And I have to admit, I do. The Steinkjer Positives are highly sought after, they are very seldom for sale. If you find one, it is usually in need of restoration and have a very high price at the same time. So what to do when you want one? Anwer: you build your own instrument. One can purchase plans and parts for street organs at various sources. My suggestion would be the Busker Organs. They are not so complicated to build, and they play paper roll music which can be bought from several suppliers. 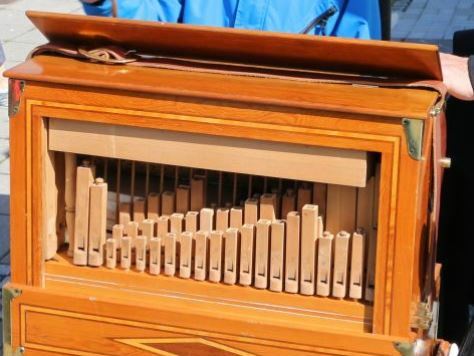 If you want a real barrel organ with a barrel holding pianowire pins and lifters, you have no choice than to look at other organs and design your own as far as I know. I wanted a barrel organ, so I had to design one myself. I recommend people to contact organ flute builders in order to learn the basic tricks of the trade. I did learn my basics from Jann-Magnar Fiskvik, and I have never regretted the year of research and discussions which led to the flute design and menzuris I have been building. My organ is a free and modern derivation of the original Steinkjer Positives. It has major parts similar as 200 years old instruments, but I have introduced plastic parts for valve openings. I also plan to install a MIDI chip which have attenuators for opening the valves electrically. By this my instrument will play any music, and I dont have to rely only on the 8-9 songs nailed into the barrel. It is however the flutes which makes the sound, and all the sound is a result from your work with them. The mechanics inside the instrument is also rather complicated to make, but it is after all just mechanics. I did make my flutes from 6 parts of wood. The "top" of the flute is where the hole where the sounds is made. I made the top part and the inner central blocks of birch. Birch is a hardwood, accessible and it do not get so much affected by damp air. The 3 remaning parts, sides and bottom i made from ordinary spruce. Pine is not a good material for flutes, since it is perforated. Spruce is a better choice even if this also is highly affected by damp air. I will have two types of pipes in my organ, the lowest sounds will come from enclosed (gedacht) pipes, and the highest notes from open pipes. There will be one bottom rack of mostly open 8 feet enclosed flutes. And then three choirs of one enclosed 2 feet, and one open 2 feet. 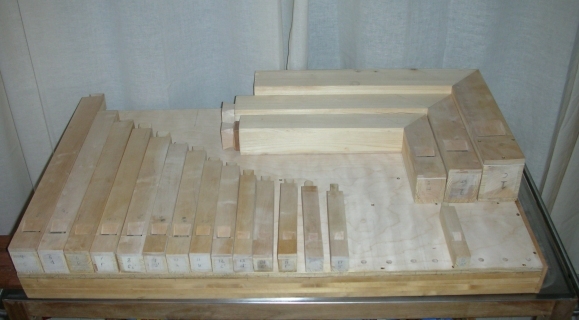 I have plans for adding a 2' perfect fifth, flute rack also, to get the sound a bit more powerful. 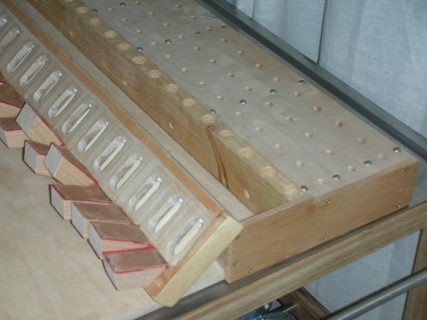 Above you can see the design of the enclosed flutes, It is literally a box of 4 wooden pieces with a plug with airchannels on the left side, and a plug on the right side which is moveable to tune the flute. They are actually not so complicated to make, and if one follows the menzuri lists carefully, they even sound rather good and loud. The trick is to make all pipes sound dymaically the same. If not careful when making them, lower pitched flutes might not be loud enough. The open flues do not have the plug to the right, but either an adjustable metal flip, or as the drawing, a wooden piece to adjust the pitch of the flute. I plan to make the casing in spruce, with a front piece of birch. It will probably be brown stained and varnished. My goal it to get it similar as a positive made by Tharaldsen. Parts of the front frame will be painted traditionally with gold bronze. 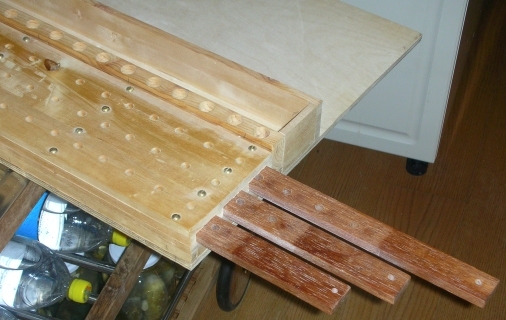 The box and base will be glued and joined with pegs. This will disallow the possibility to open the instrument later, but since all parts have relative good access for repair, and the windchest and channels are made using modern glues, I think that will not be a problem. Brass fittings on the corners on top of the box I will make of gold bronze with holes and marks on the corners of the base for screws. Christian Tharaldsen had a special mold for these, but I will not try to copy his style. My instrument is not to be a perfect copy of a Steinkjerpositive, nor a reproduction. It will be a modernized instrument built in the "soul" of the old instruments. The wind is produced by a double-acting pump which is wedge-shaped, with one wedgebellow acting as a air magazine. The magazine bellow will be charged with two springs. I plan to make the bellows using goatskin, and cardboard edges in the true Steinkjerpositive style. The crank mechanics will probably be made in steel with a brass handle and wooden knob. The crank will pull the wind bellows, and rotate the barrel. Mechanics will be made of steel and brass and not wood. This allows for more accurate movements. 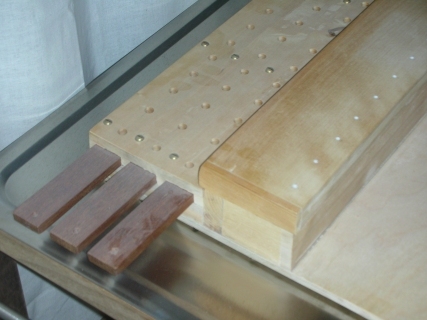 The tilt beam which sits at the top of the box with lashes which read the positive spikes on the roll will be made from hardwood and have brass bearings for the rockers. Rocker bearing is a brass string that goes through the lashes. Pushrods with pins that are hinged in the rocker, and press down and open the valves in the airchest. These will be added with a metal part and I will add attenuators which is driven by electronics connected to a PC with midi. The plan is to make the instrument able to play with roll having up to 10 songs, and also be able to utilize midi from a PC in order to extend the reportoire. I have been thinking a lot about the roll, and how to make it. Beeing a programmer on PC's the solution will probably be a program which "transfers" MIDI to paper which will be glued on the wooden roll. The spikes and pegs will then be marked on the roll with great accuracy and creating the roll should be possible. C G H c d e f fs g a h c' e' f' fs' g' a' h' c' c'' d'' e''. There are 4 choirs, where one is connected all the time (in the bottom of the case) and 3 choirs in a rack inside the case. 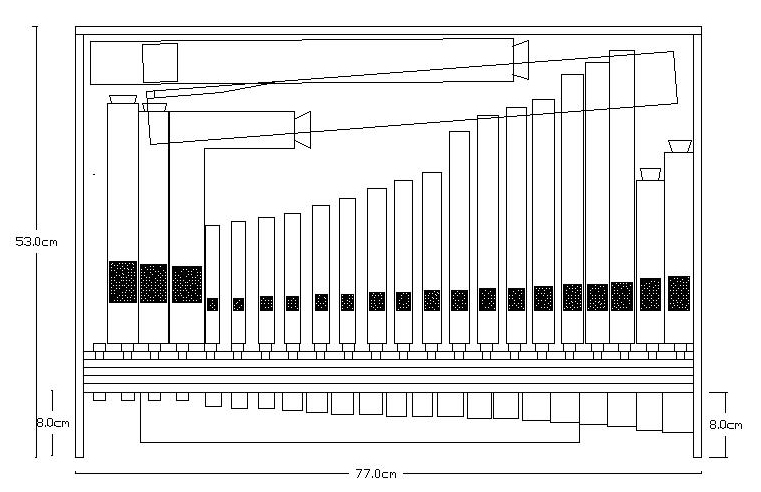 The bottom choir is mostly made 8 feet enclosed pipes (gedacht), The three upper choirs are not 100 % determined yet, but I think it will be a 2 feet, 4 feet and a 2 feet perfect fifth. Tradiditon was usually 4 feet, 2 2/3 feet and 2 feet, so my instrument might sound a little different. It depends a little on knowledge, but I have also been fiddling with the though of adding a rack of clarinet style pipes instead of the open 2 feet one. 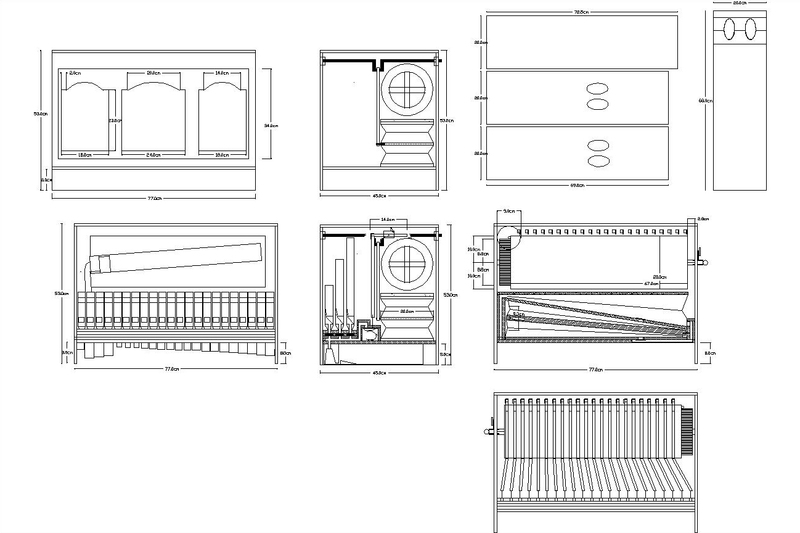 I did design my instrument in Autocad, and I have put the drawings here for you to see. I have tried my best to both 2D and 3D design this instrument so I know there is space for everything inside. But I must admit, there is quite a few issues which I have to solve when I make it. (Click on the images in order to see the full size picture). I have more drawings than this on Autocad files, and I present you here with only a few images in order to comprehend how these instruments are made, and really how complicated they were thinking about the most of the them were a couple of centuries ago. Side view of all faces with internals in place. Front view with four feet flutes in situ. Bottom view with 8 feet flutes in situ under the instrument. If you wonder which menzuri I use on each flute choir, you can look at my menzur list written in Excel downloadable as a zipped file. This zipfile is in Norwegian regarding comments, but if you wish to know a little more, I can translate if you ask. I have been working on this project quite a bit, but not enough in order to have any instrument playable. But I still add a few images here from the things I have made so far. Basically the valves, airchest and 8 feet flutes are done. the 3 choir selector valves which can be pushed out or in to let air go to the choir. Under the instrument is the location of the 8 feet flutes. There is 4 unbuilt flutes, and half a bass only in the picture. Vindchest and valves close up. Array of choir valves. One pull this out one inch and allow air to the array of flutes. 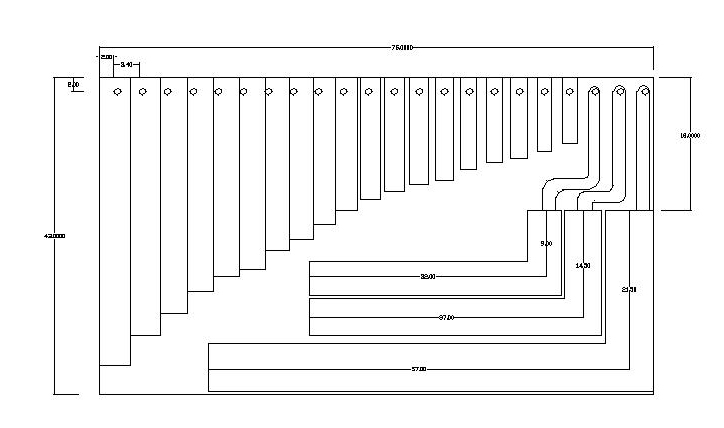 This enables the instrument to play with only one array or selectable between them. The 8 feet bottom one will always play, but the 3 top ones can be turned on or off. pressured air in the windchest leaves the hole in the top into the row of flutes just behind it. 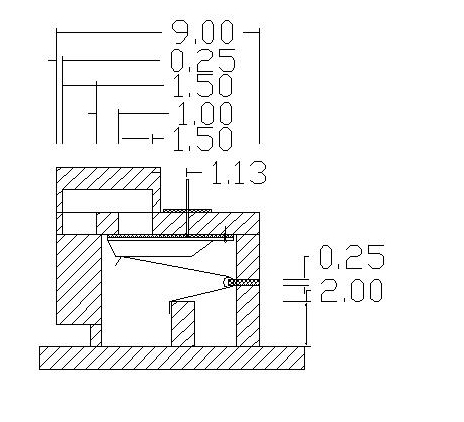 My instrument will have a handcranked double bellow which will pressurize a wind magazine bellow, which in order will feed the windchest (box under valves). If I avoid leaks this box will have a constant pressure of wind for the flutes, and with a large bellow, enough wind to play up to 16 flutes at a time. When one valve is opened, the air escape into channels which leads to the flute underneath, and to the 3 flutes on the top. The bottom flute will always play, but the top ones can be selected one by one. Basically the instrument then will be able to play 4 flutes for each tone at maximum, and one flute per tone as minimum. This is to enable dynamics to the music which is played. I will add hidden electronics to my instrument, in order to utilize midi files. Initial plan was to use Bob Langs Xylotron electronics and actuators. I have purchased the MIDI cpu, and I am working to find a place where it can be hidden and be invisible. Basically I will just lift the tilt beam off the roll, and crank the instrument as usual. The midi will work the pushrods, and the crank will create wind to the flutes. These types of instruments I believe originally came from Germany. And many of the finest instruments of this type is built there today. The mechanical organ comes in a variety of sizes from a hand held unit to a full orchestra which need to be transported on a hanger. Hope you liked this very short introduction about my project. We are not many instrument builders in the world, so feel free to contact me if you have a similar project.